The American mezzo-soprano, Lorraine Hunt, was born to musical parents: Randolph Hunt, a music teacher and a conductor of community ensembles and operas, and Marcia Hunt, a contralto and a voice teacher. Her father arranged for her to study the piano and then the violin. At 12 she switched to viola and began playing in youth orchestras and singing in the high school choir. She studied voice and viola at San Jose State University. 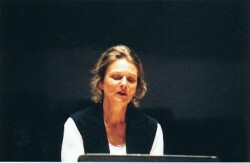 Upon graduation, Lorraine Hunt became a freelance player in the Bay Area noted for her expertise in contemporary music. On moving to Boston she was particularly drawn to the music program at Emmanuel Church, where Craig Smith conducted the orchestra and choir. But during these years she also studied voice at Boston Conservatory. Lorraine Hunt began focussing on singing when she was 26. Her breakthrough came with the Pepsico Summerfare festival in Purchase, New York, in 1985 when she was cast by Peter Sellars in his production of Händel’s Giulio Cesare. 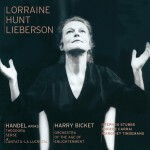 For the next decade Lorraine Hunt’s career thrived as she collaborated with the early-music conductor Nicholas McGegan and the Philharmonia Baroque Orchestra on a series of recordings of Händel operas and oratorios (Susanna, Theodora, Ariodante); took part in Sellars’s updated production of Mozart’s Don Giovanni and, later, his triumphant staging of Theodora at Glyndebourne. During the 1996-1997 season Lorraine Hunt appeared in the roles of Charlotte in Werther at the Opéra de Lyon under the baton of Kent Nagano; Sesto in Giulio Cesare at the Opéra National de Paris; Phèdre in Rameau’s Hippolyte et Aricie at the Palais Garnier in Paris and at the Brooklyn Academy of Music with William Christie and Les Arts Florissant; and Triraksha in Ashoka’s Dream, a new opera by Peter Lieberson, at the Santa Fe Opera. Concert appearances included performances of Bach’s Magnificat with the San Francisco Symphony and Michael Tilson Thomas; Berg’s Seven Early Songs with the Berlin Philharmonic and Nagano; Händel arias with the Händel & Haydn Society at Tanglewood; and a program of Mozart and Brahms at the Mostly Mozart Festival with members of the Chamber Music Society at Lincoln Center. Performances of the 1997-1998 season included the title role in the New York City Opera’s production of Xerxes; Jocasta in Oedipus Rex with the Netherlands Opera; Ottavia in L’Incoronazione di Poppea at San Francisco Opera; a return engagement with the Santa Fe Chamber Music Festival; and a program of music dedicated to John Harbison at Weill Hall. Lorraine Hunt met the composer Peter Lieberson in 1997 when he selected her to sing in the premiere of his opera Ashoka’s Dream at the Santa Fe Opera. They were married in 1999. In Boston’s Symphony Hall in November of 2005 she performed her husband’s Neruda Songs, Lieberson’s setting of five Spanish sonnets by Pablo Neruda, each a reflection of a different aspect of love. The performance, with the Boston Symphony Orchestra conducted by James Levine, was repeated a few days later at Carnegie Hall. It would be her last New York performance. Successes of the late 1990’s included the role of Irene in Händel’s Theodora at the Glyndebourne Festival in a new production by Peter Sellars (a selection of Irene’s arias and other Handel vocal music were recorded on AVIE ); the title role of Charpentier’s Médée with William Christie and Les Arts Florissants in Europe and at the Brooklyn Academy of Music; the title role of Ariodante with Nicholas McGegan at the Göttingen Festival; the title role of Xerxes with the Los Angeles Music Center Opera; and Haydn’s Scena di Berenice with the Boston Symphony Orchestra at the Tanglewood Festival under the Baton of Jeffrey Tate. It was typical of the self-effacing Lorraine Hunt Lieberson to be drawn to the secondary role of Myrtle Wilson, the mistress of wealthy Tom Buchanan in John Harbison’s The Great Gatsby for her 1999 Metropolitan Opera debut in New York. 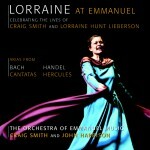 In the early 2000’s Lorraine Hunt Lieberson also gave a series of shattering performances of two Bach cantatas for solo voice and orchestra, semi-staged by the director Peter Sellars, with the Orchestra of Emmanuel Music conducted by Craig Smith. These concerts were performed in Lincoln Center’s New Visions series, in Paris, Berkeley, and at the Barbican in London. Lorraine Hunt Lieberson had a maverick career. She was a consummate recitalist and concert singer and a riveting operatic performer; her repertoire ranged from the Baroque to the contemporary. On the opera stage she excelled in roles as diverse as Médée (Charpentier), Sesto (Mozart), Carmen (Bizet) and Xerxes (Händel). She preferred to work in close-knit conditions with directors and ensembles who shared her artistic aims, especially at festivals like Glyndebourne in England and Aix-en-Provence in France. For the last 18 months of her life Lorraine Hunt Lieberson had sung only sporadically, cancelling most performances due to ill health. Her last professional activity had been touring with the Boston Symphony Orchestra in March 2006, singing music by her husband, Peter Lieberson. Lorraine Hunt Lieberson died on July 3, 2006 at her home in Santa Fe, New Mexico at the height of her musical and expressive powers, aged only 52.